A study conducted y the Australian Institute of Marine Science, concluded that sharks are worth far more alive then when sold for finning. Now, given, shark finning is just awful, and we are not suggesting that THIS be the reason to stop it. You don’t need any other reason, just don’t do it. Anyways, sharks all over the world, are in serious declined, mostly in part to shark fin soup demand in Asia. It is estimated, that commercial fishermen kill up to 73,000,000 sharks a year…73,000,000!!! This is mostly done to supply the fin trade. Scientists estimate that upwards of 30% of all shark species are threatened, or near threatened with extinction. A study initiated by the PEW environment group, demonstrated that profits from dive tourism, far outweigh the revenue generated from finning. This study, whose main focus is the Pacific Island of Palau, investigated the overall “worth” (terrible word, we know) of a live shark, vs one that is finned. Matt Rand, of the Pew Environment Group said “What we see in Palau, and other vacation destinations, is that sharks can be a significant economic driver. As a tourist attraction, reef sharks bring approximately $2,000,000 to the economy of Palau, over their lifetime.” Of the 80,000 tourists who visit Palau, over 50% are divers, many of which come specifically to dive with sharks. The calculations used in this study showed that as a result, a single reef shark, that frequents Palau’s reef, has an annual value to the tourist industry of $179,000, vs. only $108 when sold for consumption. So again, as disgusting and cruel a practice as finning it’s also economically idiotic! 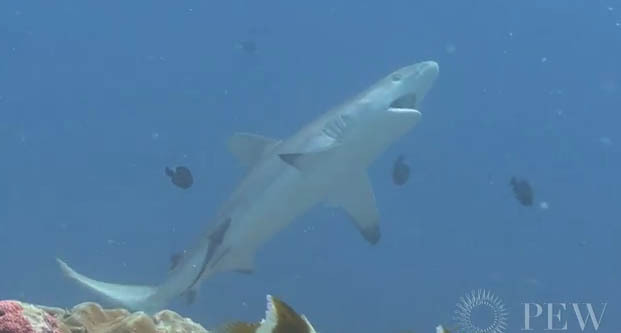 Palau declared it’s reefs to be a shark sanctuary, several other nations and states, including the republic of the Maldives, Honduras, Guam, CNMI, Marshall Islands and Hawaii, have followed suit. In conclusion, this study shows that in additional to it being a despicable practice, and one that could have dramatic ecological repercussions, we even have an economic reason to unite against it’s continuation. You may remember the very powerful public service announcement, featuring Yao Ming, against the sale of shark fin soup.